Pop star Marc Bolan has been killed in a car crash in south-west London. 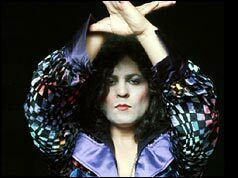 The 29-year-old former T-Rex singer was killed instantly when the car being driven by his girlfriend, Gloria Jones, left the road and hit a tree in Barnes. Miss Jones – an American singer who had just returned from the US – broke her jaw and is suffering from shock. The couple’s 20-month-old son was not in the car when they crashed at 0400 BST on the way to Mr Bolan’s home in Richmond after a night out at a Mayfair restaurant. Miss Jones’ brother – who was following their purple mini – told police the car was travelling at 30 mph (48.3 km/h) when it crashed at a notorious accident blackspot. Phillip Evans-Lowe was driving to work at a local dairy when he witnessed the smash. “When I arrived a girl was lying on the bonnet and a man with long dark curly hair was stretched out in the road – there was a hell of a mess, I rushed to get the police,” he said. According to the dead star’s manager who was with them during the evening, Miss Jones had been drinking moderately at the restaurant. “They did not have a lot to drink – just a bottle of wine with the meal and a few after,” he said. Mr Bolan had just completed a television series and was said to be poised to make a comeback after spending the last three years abroad as a tax exile. His former manager, Tony Secunda, said the son of a Hackney porter whose real name was Mark Feld had always feared he would die in a car crash. “He would never drive a car, he was always scared – Marc never had a driving licence, he refused to learn,” he said. A few days after the crash fans broke into Mr Bolan’s home and stole most of his possessions. Gloria Jones went back to America after recovering from the accident. She was later summonsed to appear in court in London on charges of being unfit to drive and driving a car in a dangerous condition, but she never returned to face the allegations.